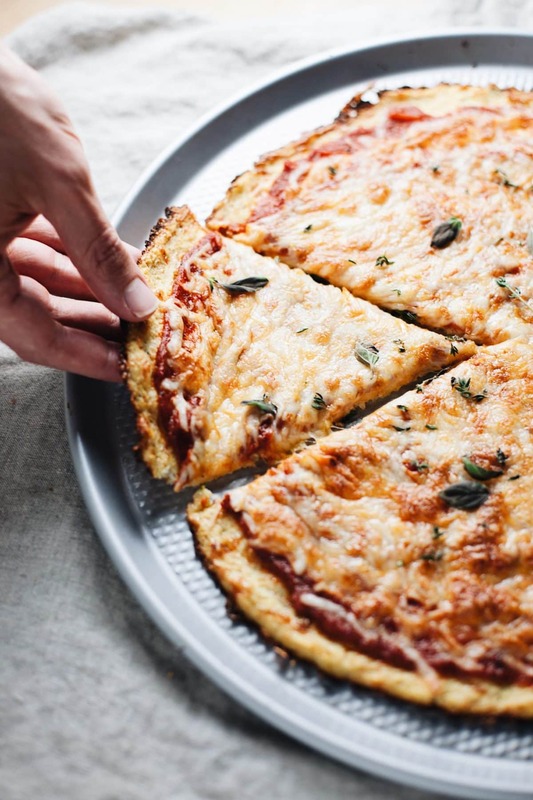 The best low carb cauliflower pizza crust – thin, cheesy pizza crust made completely of cauliflower. Takes less than 1 hour to make, is vegetarian & gluten free friendly. So delicious! 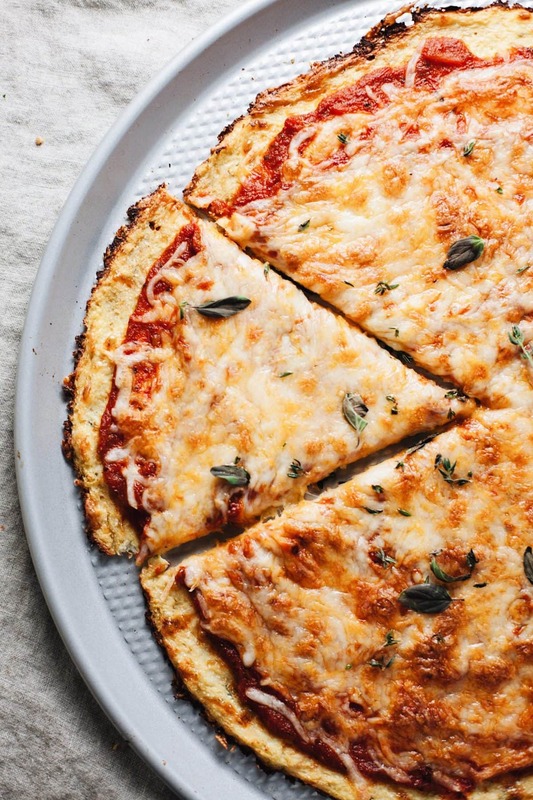 Have you ever had a cauliflower pizza? Or heard of it? Drew and I have been a part of the cauliflower pizza fan club for a couple years. It’s an amazing option for pizza night if you wanna keep things on the healthier side. Even though this pizza is plant-based it is cheesy, garlic-y, satisfying, & delicious! Use a food processor or high powered blender to finely chop up cauliflower into really small rice size pieces. Use a clean, thin dish towel to thoroughly ring out as much moisture/liquid from chopped cauliflower as possible. This will help the pizza not be soggy or watery. Form your crust on the thinner side to help the pizza crisp more in the oven. 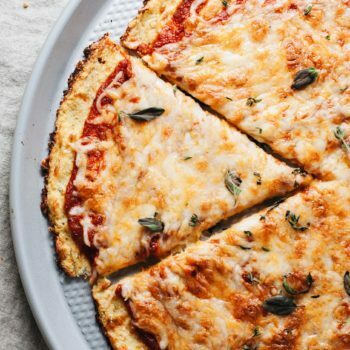 Does cauliflower pizza crust taste good? Absolutely. 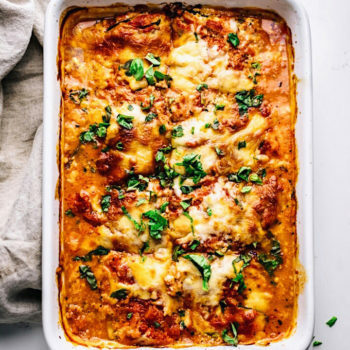 It has a slight cauliflower taste, but you taste more cheese, tomato sauce, and herbs when eating – and it completely satisfies all of my pizza cravings. In fact, I crave cauliflower pizza just as much as regular pizza! 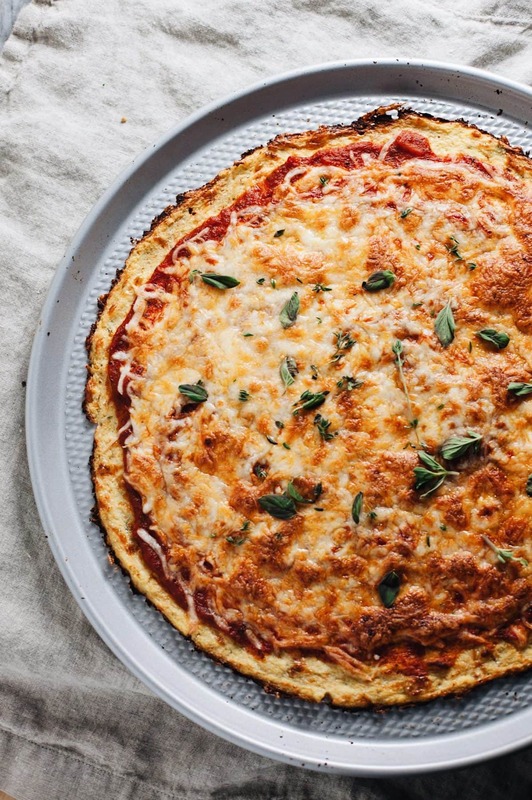 Can you make cauliflower pizza crust without a food processor? Yes – you can use a high powered blender and chop cauliflower in shifts. Or, if you have the patience, chop cauliflower with a large knife into small rice pieces. You can also purchase cauliflower rice to make this recipe. 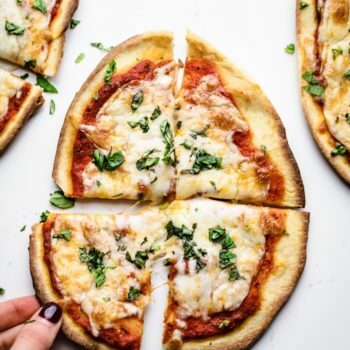 Cheesy low carb pizza crust made completely from cauliflower! A DELICIOUS and healthy option for pizza night. Preheat oven to 400F. Chop cauliflower in rough pieces and place in food processor or high powdered blender - chop on high until cauliflower is really fine small pieces - I do this in small batches. Place in a thin dish towel and completely ring out extra moisture/water from cauliflower - this process is easier to do in small batches. MIX: Add cauliflower to bowl with egg, oregano, garlic powder, salt & pepper, mozzarella cheese, and parmesan cheese. SHAPE: Lay parchment paper on a pizza pan, or lightly oiled pan, and add cauliflower dough. Press tightly together and form into a circle, make sure it's on the thinner side. Bake for 20 minutes. 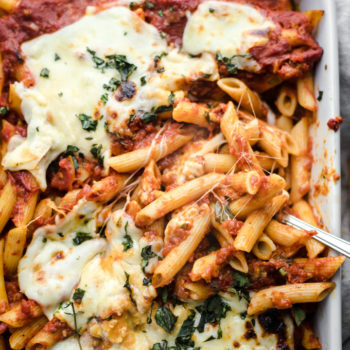 Remove and add sauce, cheese, and other desired toppings. Bake for an additional 10 minutes. Let cool for several minutes, slice and eat! Always wanted to try cauliflower pizza! Will definitely have to try this. I will definitely try them .